Mauricio’s Facebook post caption claimed that Yuki and Moto are selling delicious Japanese ramen and churros at a very low price so right after the Japanese vendors went viral, the Eatventurers decided to hunt for them so we can try their ramen for ourselves. It was hard to find the stall as bystanders said the stall does not have a definite store area and operating hours. They sell twice a day: morning and afternoon, but no definite time. 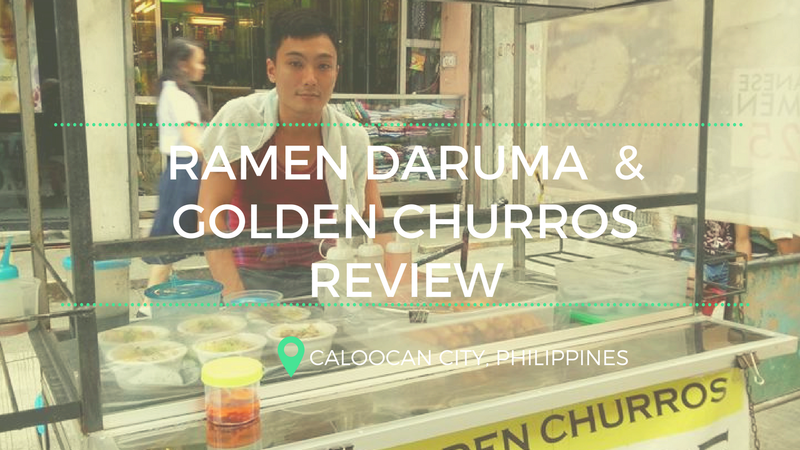 Apparently, Ramen Daruma has three branches in Caloocan City and the one featured by Mauricio was along 11th Avenue of Grace Park, South Caloocan City. This one is the easiest to locate as it is between the Shrine of Our Lady of Grace Church and Mercury Drug Store while the other branches are located in University of Caloocan City and along 10th avenue. Since we went during the height of their online fame, several customers also went to check out their stalls and it came to the point that they ran out of noodles since it really is a small stall. Their ramen then was selling like hotcakes! We first tried their Golden Churros in their UCC branch. 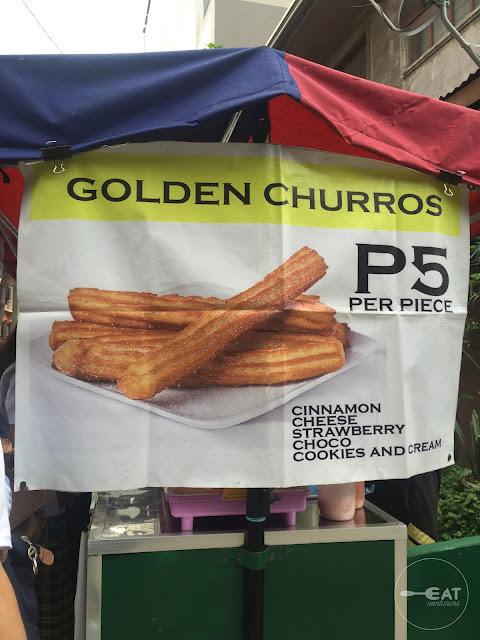 We can say that this one is really “sulit” for its P5 per piece price. It is good for merienda. The churros may not be as long and thick as La Lola Churreria’s churros but it tastes fine. It is about more than an-inch long and they offer it in various flavors: cookies and cream, cheese, cinnamon, chocolate and strawberry. Note that these are only powder flavors poured on the crust and not fillings. While we were satisfied with their churros, we were disappointed with their flagship product, shio ramen. Shio means salt-based. We were not expecting much of it since it is only priced P25 but since they are Japanese we were at least expecting for a little bit taste or something special on the broth. We were only given the noodles, pieces of pork, spring onions, a sauce and was not given soup. We were just instructed to add hot water since they already ran out of it. We’re not sure what the sauce was but it made the ramen even more salty. Despite this, we understand that the quality of the ramen was only compromised by the number of customers during our first visit. 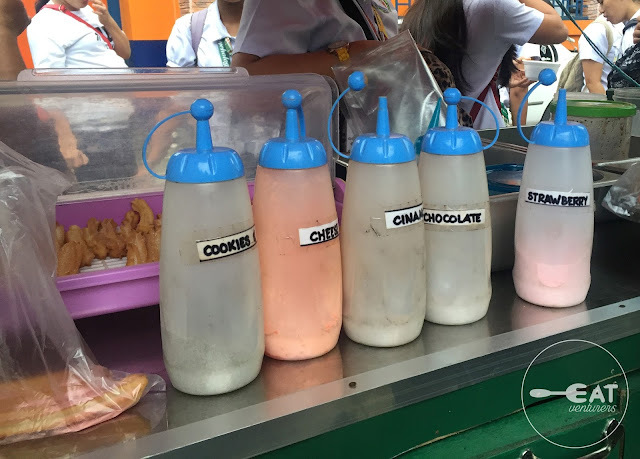 The Eatventurers learned that they now have other branches in Pandacan, Manila near Pedro Gil Station; Congressional Avenue Wet and Dry Market in Quezon City; Munoz; and Barangka Drive, Mandaluyong City, among many others. That's because they also ventured into franchising and food cart services. You may check their other branches in their Facebook page. We admire how Yuki and Moto thought of this mobile ramen and churros store and let their businesses grow. We interviewed them and they said they are being helped by their Filipino friends.They actually do not know how to speak Filipino and know only a few English sentences. 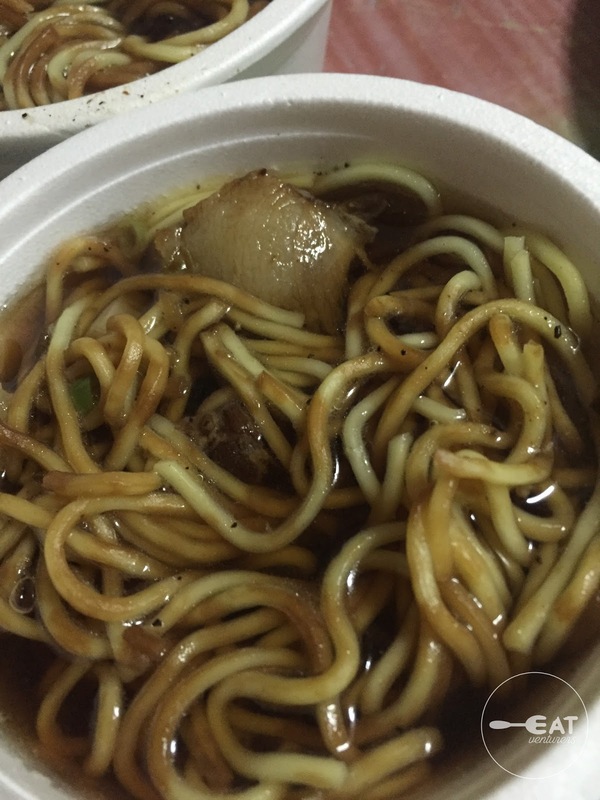 As their branches grew, Ramen Daruma added other items on their menu such as Gyoza (fried) for P8 per piece, korroke, tacos, siomai, and okonomiyaki (P65- whole, P33 1/2 slice, P17- 1/4 slice). Mauricio’s post as of posting earned over 42,000 reactions, 846 shares and 12,000 comments. Yuki and Moto were also featured on television by news and magazine shows. We heard the sales has been skyrocketing since. Contact Nos: +63949 320 7088 or 2831206 (for reselling and food cart services in events)Operating hours: Morning (Between 7:00 a.m. to 10:00 a.m.) and Afternoon (Around 2:00 p.m. to 4:00 p.m. onwards), other branches 2:00 p.m. to 9:00 p.m.